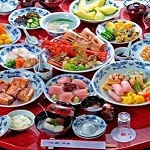 Read the history of five Japanese cuisine! Shojin-ryori and Kaiseki-ryori are very famous Japanese cuisine in the world. Shojin-ryori also known as Shojin cuisine or devotion cuisine is the Buddhist vegetarian cuisine of Japan. Kaisaseki-ryroi(Kaiseki dining) is a traditional multi-course Japanese dinner. They are also derivered from Daikyo-ryori which is the oldest style of the traditional cuisine in Japan. Daikyo-ryori consists of rice, raw meat, dried fish, fruit and confectionery. Only noblemen ate it on a happy day like New Year's day in Heian period(794-1185). They ate this cuisine with seasoning with salt or vinegar by themselves because this cuisine was tasteless. Cooking skills was not developed then, Daikyo-ryori was simple though it was cuisine. On the other hand, Buddhist priests established Shojin-ryori based on Zen sect(Zen Buddhism) from the end of Heian period to the Kamakura period(1185-1333). Zen Buddhist is prohibited to eat a meat because of learning the value of life and renouncing worldly desires by suppressing ingestion calorie. In addition, Shojin-ryori might impressed on people that Daikyo-ryori was extravagance. Shojin-ryori has some dishes which taste like meat. It is said that these dishes are not for priests who are longing for meat taste but for priests who try to renouncing meat-eating. These dishes were made by grain flour, vegetable oil, vegetables, mushrooms and fruits with strong seasoning at that time. Some dishes were named after bird's name. Ganmodoki which is a fried tofu fritter means goose(gan)-pseudo(modoki). Cooking skills for Shojin-ryori developed in the Buddhist society, but they spread throughout the Japan in Kamakura period. Honzen-ryori was also established by Samurai(Bushu) from Kamakura period to Muromachi period(1336-1573). Samurai was bodyguard for noblemen before Kamakura period, but Samurai, Yoritomo Minamoto, established the first Samurai's government in Kamakura period. Honzen-ryori was combined with Daikyo-ryori's ceremonial aspect and Shojin-ryori's cooking skills. It is the first genuine style of the traditional cuisines of Japan. Honzen-ryori consisted liquor part called kon-bu and meal part called zen-bu. The start of it is the rite called Shiki-san-kon which is drinking three cups of sake(Japanese rice wine) with side dish and repeating this process three times. After that, Samurai ate meal and finished it with drinking liquor. Drinking a nuptial cup called san-san-kudo which means three and three and nine in English in a marriage ceremony derive from Shiki-san-kon. However, Honzen-ryori is a cold dish because it is cook-ahead dish. If dishes are hot, they become cold because of long time for eating and doing many rites. People wanted hot dishes without many rites, and Sen-no-Rikyu who was a master(votary) of tea cremony established Kaiseki-ryori from Sengoku period(1467-1568) to Azuchi-momoyama period(1573-1603). Kaiseki-ryori removes Honzen-ryori's rite, and focus on enjoying a meal. He established it to enjoy not only dishes but also tea after meal. Therefore, Kaiseki-ryori has the spirit of tea ceremony "Treasure every meeting for it will never recur". It regards hospitality, rationalized manners, seasonality and colorfulness as important. Above these styles of cuisine are for a certain people, Daikyo-ryori is for noblemen, Shojin-ryori is for Buddhist priest, and Honzen-ryori is for Samurai. Even Kaiseki-ryori(Cha-Kaiseki) is for Samurai, wealthy merchant and tea master. The people at large do not have a style of cuisine. However, Buddhist priests and cooks served dishes for them from Edo period(1603-1868) which was the long peace period by Tokugawa shogunate. 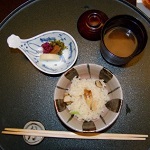 Restaurants also began to open from then, and served the new Kaiseki-ryori which bear no relation to tea celemony. Nowadays, Kaiseki-ryori(懐石料理) which related with tea celemony is called Cha-Kaiseki in distinction from another Kaiseki-ryori(会席料理). Kaiseki-ryori(会席料理) remains Cha-Kaiseki menu though it removes tea celemony. It is said that Kaiseki-ryori consits Honzen-ryori's luxury and Cha-Kaiseki's cooking skills and hot dish. At first, people eat Kaiseki-ryori at the meeting for presenting Japanese poem called Haiku or Japanese linked verse called Haikai. They came to eat it for enjoying drinking and dishes with talking before they even knew it. Nowadays, Kaiseki-ryori is a synonym for high-class Japanese cuisine because there are many cheap Japanese restaurants and fast food. If you travel Japan, you can experience Japanese culture through Cha-Kaiseki, Shojin-ryori and Kaiseki-ryori. There are few restaurants to serve Daikyo-ryori and Honzen-ryori, but there are many restaurants and temple to serve Cha-Kaiseki, Shojin-ryori and Kaiseki-ryori.